A robust, dual-layered plaque created by Gaudio for the Royal College of Physicians. The back layer is gold anodised with a brushed finish. Anodization gives our high-quality alloys a subtle shine and a rich gold surface. Printing on anodised aluminium offers a stylish texture. The front layer is cut from glass-effect acrylic. Glass-effect acrylic is a cost-effective, light-weight alternative to a glass layer. 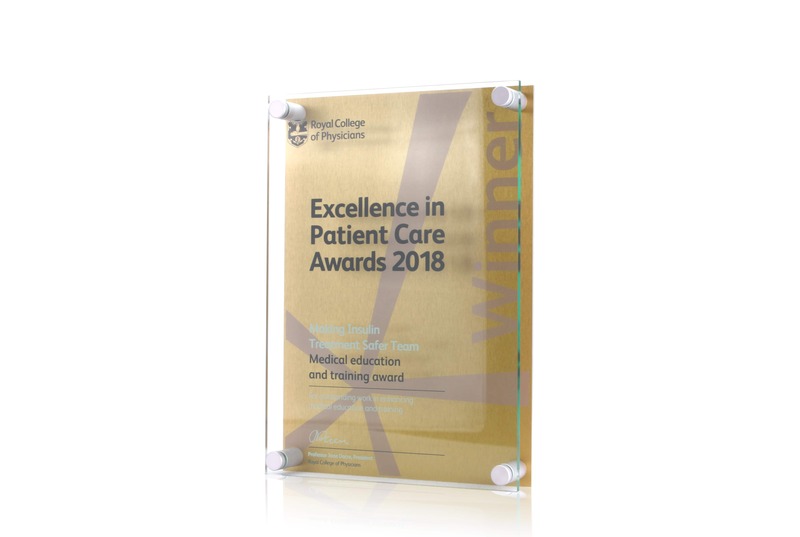 The Royal College of Physicians plaque boasts a contemporary twist on a classic design. A bespoke plaque offers a unique design, and our designers will work with you to find the perfect size, shape, and material to meet your needs. We offer a number of in-house manufacturing options, including UV-printing. For the Royal College of Physicians plaque, we’ve reverse printed the personalised detail. The print details the recognised party and their achievement, as well as the RCP logo and Professor Jane Dacre’s signature. A bespoke plaque from Gaudio is a durable option for any internal or external plaque. It’s never too early to get in touch, and out designs service is free with no obligation. To find out more about the bespoke award or plaque Gaudio can create for you, call us on 01242 232 383. Alternatively, email sales@gaudio.co.uk, or fill in the ‘contact‘ form on our website, and one of our Project Managers will be in touch to discuss your requirements.